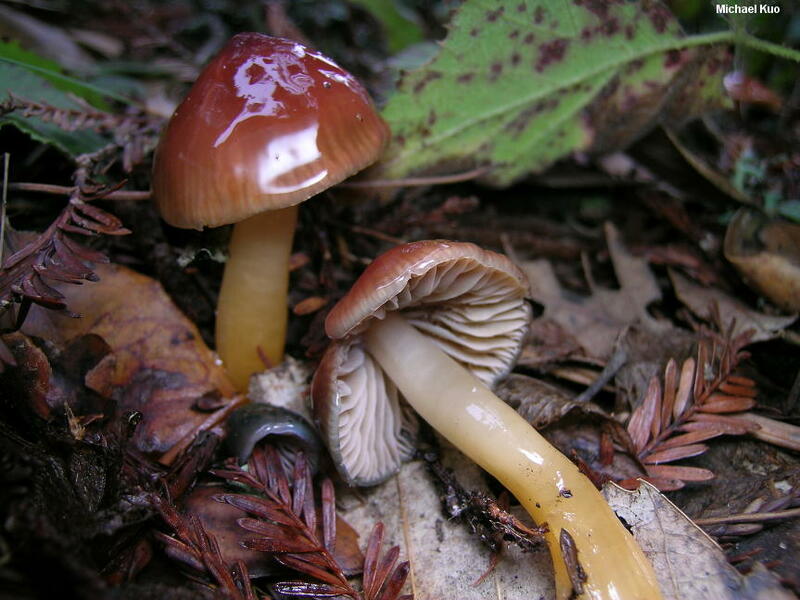 This beautiful mushroom is found in California's coast redwood forests, over winter. It features a deep blue, slimy cap that quickly turns dark red--then slowly fades to dull yellowish. Its stem is also slimy. The mushroom is essentially a blue-then-red version of the well known "parrot mushroom," Gliophorus psittacinus, and it was originally described as a variety of that species by Hesler and Smith (1963)--back when the parrot mushroom's scientific name was "Hygrophorus psittacinus," leading to its designation as Hygrophorus psittacinus var. californicus. However, the parrot mushroom was then moved to the genus Hygrocybe, and no one ever made an official new "combination" to create "Hygrocybe psittacina var. californica." And now, thanks to DNA research (see Lodge and collaborators, 2013) the parrot mushroom has been moved again, this time to the genus Gliophorus, and no one (that is, no one in a peer-reviewed, scientific publication) has designated the name Gliophorus psittacinus var. californicus for this poor little mushroom, which is frankly not very interested in taxonomic vagaries and would rather just be beautiful and blue, or red, under the towering redwoods. Thus we have no "good name" for our happy little friend, other than Hygrophorus psittacinus var. californicus, even though we know that it is not a Hygrophorus and that it may well be an actual species in its own right, rather than a variety of the parrot mushroom (see the discussion of this species complex on the page for Gliophorus psittacinus). Ecology: Precise ecological role uncertain (see Lodge and collaborators, 2013); appearing under coast redwood and perhaps under other conifers; growing scattered to gregariously; December through February; coastal California. The illustrated and described collections are from San Mateo County; the type collection and a paratype collection were made in Humbolt County. Cap: 5-30 mm across; hemispheric, expanding to broadly convex; bald; slimy; blue at first (overall or in a marginal zone), becoming dark red and eventually fading to dull yellowish; often with olive hints in age; the margin often thinly lined. Gills: Narrowly attached to the stem; nearly distant; buff to pale yellowish; short-gills frequent. Stem: 10-40 mm long; 2-7 mm thick; equal; bald; slimy; yellowish above and brighter orangish yellow below when young. 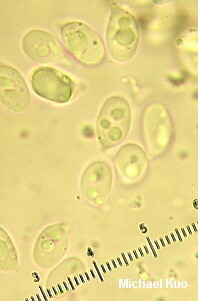 Microscopic Features: Spores 8-10 x 4.5-5.5 µ; smooth; ellipsoid; hyaline and multiguttulate in KOH; inamyloid. Basidia 45-60 µ long; 4-sterigmate. Hymenial cystidia absent. Lamellar trama parallel. Pileipellis an ixocutis. REFERENCES: Hesler & Smith, 1963. (Lodge et al., 2014.) Herb. Kuo 01120501, 01130511.